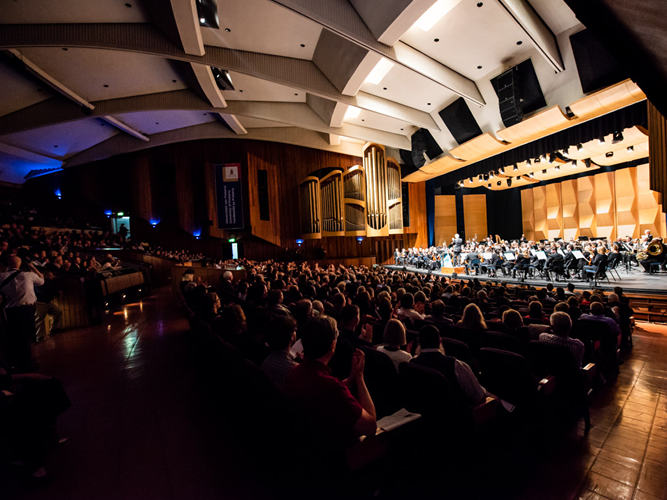 On August 16 the Minnesota Orchestra presented the third concert of its South African tour, this in the Aula Theatre at the University of Pretoria. Below is a photograph of the Orchestra at this concert. The program was the same as presented in Cape Town on August 10, which was the subject of a prior post. Here we will examine, the Orchestra members’ interactions with local musicians and facts about Pretoria. A subsequent post will examine Nelson Mandela’s inaugural speech as South Africa’s President in 1994 at the Government’s Union Buildings in Pretoria. On the afternoon of August 15, the Orchestra had a side-by-side rehearsal with the South African National Youth Orchestra (SANYO), which is now in its 54th year, which has become one of the country’s most successful nurturers of its finest young musicians and which Osmo Vänskä in 2014 had guest conducted. After both groups had dinner together in a nearby restaurant, the SANYO musicians attended the Minnesotans rehearsal with the combined choir of the Minnesota Chorale and the Gauteng Choristers. The next day, the students spent the day working one-on-one with musicians in master classes and chamber music sessions. Later Vänskä and a small group of the Orchestra attended a reception at the U.S. Ambassador’s residence. Afterwards the U.S. Charge d’Affaire, Finland, went with the musicians to the Aula center for the concert. With a population of 742,000, Pretoria is in the northeastern part of the country only 34 miles north-northeast of Johannesburg. It is the seat of the administrative branch of the national government with Cape Town having the legislative branch and Bloemfontein the judicial branch. Pretoria also is known as an academic center with three universities, the Council for Scientific and Cultural Research and the South African Bureau of Standards. Minn. Orchestra, Minnesota Orchestra in Pretoria (Aug. 16, 2018) . Minn. Orch., Pretoria/Aug 15; Minn. Orch., Pretoria/Aug. 16; Kerr, Small moments have big impact on orchestra’s South African trip, MPRnews (Aug. 16, 2018).